The things people want and need are often far away from where they live. It’s a bit of geographic inequality that applies to all of us. The U.S. trade deficit with China is one example of the problem. Another is ecosystem services. Ecosystem services range from clean water to fresh air to crop pollination and many more. Even the big tree shading your house or apartment building is providing an ecosystem service. The list is so long that most scientific studies suffice with a subset. Healthy ecosystems provide them at no cost to us, but if we were forced to replicate the services ourselves, it would cost us at least $24 trillion annually.¹ Global gross domestic product in 2009 was $58 trillion. In other words, we’d have to commit nearly half of the global economy to replicating ecosystem services if they were lost. In other, other words, we can’t afford to lose them. The real wrinkle with ecosystem services is that many are most needed where they are most difficult to preserve—in dense urban areas. That’s what a 2009 study investigating the geographic disparity between supply and demand of ecosystem services found. The study’s author built a model to determine which lands would be most economical to purchase to provide a given service. He based the model on bid-rent theory, which describes how much money people are willing to pay for property close to downtown. The closer to downtown, the higher the rents. The model also takes into account the ease with which each ecosystem service can be “transported,” or the distance at which the ecosystem service remains beneficial. Using these two costs, the author attempts to find the sweet spot where governments and conservation groups can get the most bang for their buck. Parkland, on the other hand, is not as readily transportable. For people to enjoy a park, it needs to be within a reasonable distance from their homes. The study found that the best parks—those that have the highest recreational value in the model—were those closest to the city center. Recreational value diminishes with distance from the city center, out to about 5.4 miles (10 km) from downtown. After that, one park is just about as much fun as any other. The sweet spots are those that can protect two, three, or more ecosystem services. For example, a forest set aside as a regional park on the outskirts of a city can provide clean drinking water, reduce runoff to mitigate flooding, store carbon, and preserve biodiversity. This is, however, a best case scenario. The authors of a 2006 paper reports that, in their study area, only a select few patches of land could support four or more ecosystem services. Governments and organizations looking to protect ecosystem services must spend their money wisely, allocating it where the most people will derive the most benefit for the least amount of money. Where those paths cross may not be obvious, though.³ Ultimately, the answer will come down to the value we place on each ecosystem service. 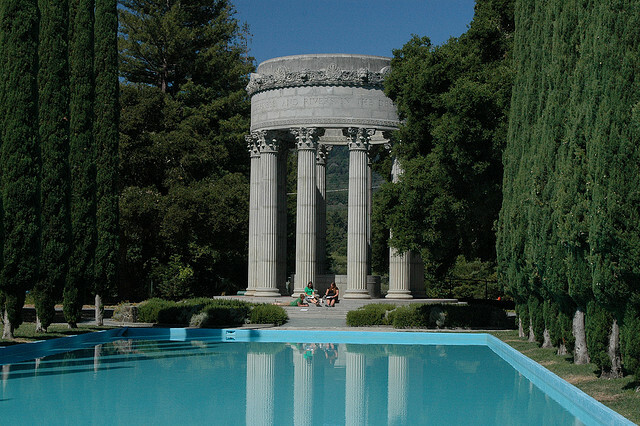 About the image: The Pulgas Water Temple was built in the 1930s at the terminus of the Hetch Hetchy aqueduct. Before 2004, water from the aqueduct flowed through the temple before traveling on toward San Francisco.